Canon has set the tone in the sub $200 category with an ultra-compact camera that is loaded with useful settings, offers appealing specifications, and delivers excellent photos in a wide variety of settings. Not to mention it boasts some excellent High ISO performance. All for just $199 US or less. Read more in our Full Conclusion. Underneath the PowerShot ELPH 500 HS and the 300 HS, the Canon PowerShot ELPH 100 HS is the entry-level model to the 2011 ELPH lineup. The ELPH 100 HS offers a 12.1-Megapixel CMOS image sensor as well as a 3.0-inch LCD screen. The wide angle 28mm equivalent lens has a 4x optical zoom as well. Similar to the other models in the series, the HS System allows for pictures in low light situations without the use of the flash, thanks to usable ISO capabilities up to ISO 3200. Other features of the PowerShot EPLH 100 HS include 1080p HD video recording with a Movie Digest mode to capture a stream of short videos into a single clip. It also comes equipped with Smart AUTO for automatically adjusting focus, exposure and subject detection. 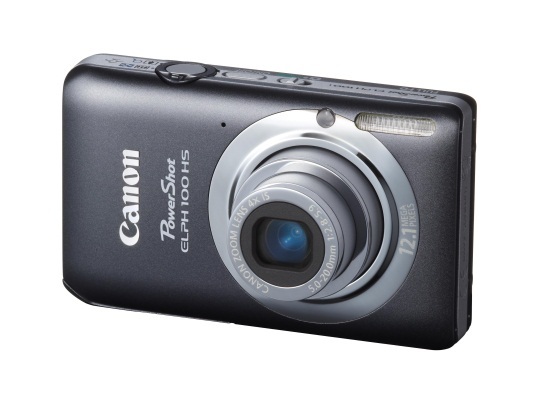 The Canon Powershot ELPH 100 HS comes in five colors (Blue, Orange, Pink, Silver, and Gray) with a suggested retail price of $199.99 US.